I heard Leo Varadkar on the radio last year: he spoke of the mystique of the railway, boasted he'd actually been on a train earlier that day so knew of what he spoke, and then added (sternly) that all over the country of Ireland there were stations and lines that weren't being used and railway workers who were being paid to sit around doing nothing. Obviously, he implied, he would like to cut all this waste out by closing lines and stations, which would spare the Irish taxpayer a great deal of unnecessary expense - though of course to do this he would need to be in power. I commute from Sligo to work in Dublin at Trinity College and the American College. In the mornings, I usually get the 6.43 out of Dromod: this leaves Sligo at 5.45 and is usually a fifth full by the time it arrives at Dromod. There are often 40 passengers and more on the platform waiting to board at Dromod at 6.43. 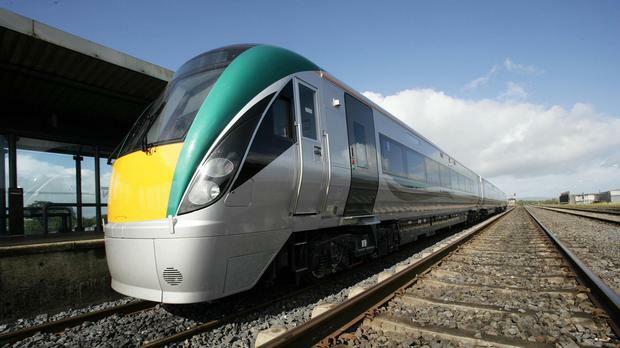 By the time the train gets to Dublin it is rammed: it is common to see passengers who have got on at Enfield, Kilcock or Maynooth standing all the way into Connolly. In the evenings, I get the 7.05 to Sligo: again, as in the morning, passengers are numerous - you need to get on board at least 15 minutes before departure from Connolly to be sure of a seat. After Mullingar the train empties quite a bit, but will still be quite full. I've often alighted at Dromod (especially if it's a Friday) alongside 60 other passengers. They say about 40,000 inter-rail passengers (I'm leaving out the figures for those who used the Dart or the Commuter services) use Irish Rail daily, most of whom are going to Dublin, and I'd be one of them. But me and all those passengers waiting at Dromod at 6.43 may not even show up in the statistics. I have been told ticket sales figures are based on sales at the booking office, while tickets sold at the vending machines outside stations aren't included (for the 6.43 at Dromod, everyone uses the vending machine). Could Irish Rail really not include machine sales in their sales stats? It seems incredible, but that's what I'm told. If true, then there are more inter-city users than is reported: but even if that's not the case, 40,000 people going to Dublin daily by train are 40,000 people not using cars to travel to Dublin, and that can only be a good thing. Once a year, Irish Rail does a snapshot of every station - a picture of activity at a certain time. It seems to me that Irish Rail invariably do the snapshot at a time the station is quietest: 3pm on a Tuesday in November appears to me to be their favourite time, because that's when there is no one around. They won't do 7.30am or 8am on a Monday in late September, when stations are mobbed by students going to Dublin. I would also point out that though it's easy to pull something out (a railway line, for example), it is difficult to put it back. It also incredibly wasteful to take it out, only to restore it later. We tore up our tram lines in Dublin in the 1950s because we were so certain the car was the future. Now we're putting them back. The way we are heading, it appears we are about to repeat the mistake with our railways. Trains, especially our rural and west of Ireland services, are in severe danger of closure. We can tell ourselves that by closing them and tearing them up we will save money, but we will eventually end up having to reinstate them. We will also, by tearing them up, aggravate the resentment that exists in the those parts of Ireland that aren't Dublin or the east. Those of us living in the provinces see Dublin getting services and lines often at the behest of commercial interests: the reopening of the Phoenix Park tunnel is a case in point. We should be making the rail system work for the whole country and to do that we have to support rail outside Dublin and the east. We also need to take freight off the roads and put it back on the railways. And we need to remember that it is becoming more and more expensive to live in Dublin. People who can't afford to live there (and I'm one of them) commute to work in Dublin and the railway is the best way of getting there. A final point: voters in the country at large (and Dublin too, for that matter) are going to be inclined to support a party that categorically commits itself to preserving what we have. They will not be inclined to support a party that categorically commits to cutting what we have. A party that wants to improve or augment rail services is going to be even more attractive to voters (but note I didn't say that). My feeing is that the promise to keep what we have (including reopening mothballed lines) will be enough. Later on, and money allowing, new lines can be built. But right now, just keeping what we have will be sufficient.